Around the year 1225 there was a woman living in Santarem, who was very unhappy with her marriage. She was convinced that her husband did not love her, and was unfaithful. She initially tried numerous things to win back the affection of her husband, but to no avail. As a desperate last attempt, she went to a sorceress. The sorceress promised the wife that her husband would return to his loving ways, if the wife would bring her a Consecrated Host. This of course greatly frightened the woman, because she knew it was sacrilege, but nevertheless she finally gave in. She went to Mass at the Church of St. Steven, and received Communion, but did not consume the Host. Instead, she left the Church immediately, and took the Host out of her mouth, putting It into her veil. She then went to the sorceress. Along the way, the Host began to bleed inside the veil. The wife was not aware of it until passersby brought it to her attention, thinking she herself was bleeding. Panic struck the woman and instead of going to the sorceress’ house, she rushed home. She then put the bloody veil containing the Host into the bottom of a trunk, not knowing what else to do. When her husband came home, she said nothing. Later in the night they were awakened by mysterious bright rays of light coming from the trunk, penetrating the wood and illuminating the entire room. The wife then confessed her sin to her husband and both of them knelt in adoration for the remaining hours until dawn, when the parish priest was summoned. News of the mysterious event spread quickly and attracted countless people who wanted to contemplate the miracle. Because of the furor, an episcopal Church investigation was promptly organized. The bloody Host was taken in procession to the Church of St. Stephen, where it was encased in wax (to contain the blood and the Host) and secured in the tabernacle. Some time later when the tabernacle was opened, another miracle was discovered. The wax that had encased the Host was found broken into pieces, and the Host was found miraculously enclosed in a crystal pyx, along with the precious Blood. This was later placed in a gold and silver pear-shaped monstrance with a "sunburst" of 33 rays, in which it is still contained today. After the investigation and approval by the Church authorities, the Church of St. Stephen was renamed "The Church of the Holy Miracle." The little house where the miracle occurred was on Via delle Stuoie in Santarem. From the time of the miracle until now, every year, on the Second Sunday of April, the incident is re-enacted by local actors. The actual Eucharistic Miracle is processed from the house, which was converted into a Chapel in 1684, to the Church. Miraculously, after 750 years, the precious blood still remains in liquid form, defying the natural laws of science. The Host is somewhat irregularly shaped, resembling real flesh with delicate veins running from top to bottom, where a quantity of blood is collected in the crystal. In 1345, Amsterdam was a tiny fishing village consisting of four streets and a few alleys lined up along the main canal. There were small modest fishermen's huts, a church, and a monastery. The monastery was the largest building in the city. The Eucharistic Miracle given to this tiny village on March 13, 1345, was the beginning of the growth for which Amsterdam is now famous. In fact, on the 600th anniversary of the miracle, March 13, 1945, the Dutch Catholics attributed all the growth and progress of their city to the Eu¬charistic Miracle which we will now present. The Eucharistic miracle occurred in a house on Kalverstreet where a fisherman named Ysbrant Dommer on his deathbed called for a priest to come to his home to give him the last rites of the Church and Holy Communion. After having heard the man's confession, the priest blessed him with the oils of Extreme Unction, and gave him Communion. The priest had no sooner left than the sick man began coughing violently. His wife ran over to him in an effort to help him, but the husband, gagging and choking beyond control, vomited the contents of his stomach, including the Host, still intact. The wife reacted instinctively. She swept up the Host and threw It into the fireplace. She soon realized her grave mistake, but the fire was raging, and she was not about to put her hands into it for fear of burning herself. That night she slept fitfully, tossing and turning. She was afraid she had committed a terrible sin and had nightmares about the Sacred Host that she had thrown into the fire. The following morning, as soon as she got out of bed, she went over to the fireplace. The fire was not extinguished yet, and the coals were still quite hot. She stoked the coals, looking for the Eucharist. To her amazement she suddenly saw the Host sitting atop a burning ember. It was not burned at all. It had not even turned color. 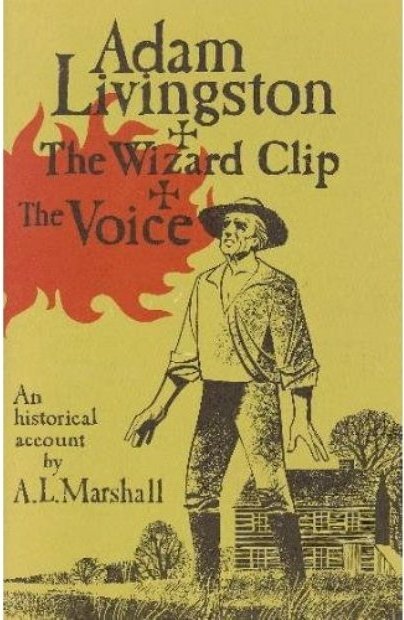 The Host was fresh and brilliant, lying among the coals. She immediately snatched the Host from the fire, and carefully wrapped it in a clean linen cloth, and placed it in a chest for safekeeping. She then called the priest who had been to her house the previous night and told him the story. The priest then placed the Host into a pyx and washed the cloth in which it had been wrapped. He then carried the Host to the parish church of St. Nicholas. The priest thought it best not to tell anyone about the incident, so as not to stir up gossip involving the woman or her husband. He took the Host, wrapped in the cloth, and returned It to the church, where he placed It in the tabernacle. The following morning, the priest found the pyx empty to his amazement, but the Host was soon discovered by the same woman when she opened the chest to remove some linens. She was stunned and confused as she knew the priest had taken It away the day before. 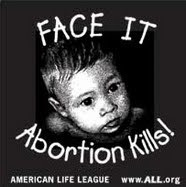 Had she committed such a terrible sin, that the Lord brought back the proof to punish her with the sight of It? She ran to the Church, and explained what had happened to the priest. 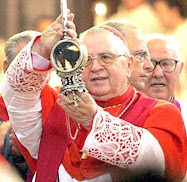 Again the priest placed the Eucharist into a pyx and returned it to the church. Then, after yet another disappearance and discovery, the priest contacted other members of the clergy for consultation. All agreed that the occurrences were a direct proof of God's intercession, and apparently a sign that the miracle should be openly honored. Jesus wanted to use this miracle to awaken His sleeping people. The Miraculous Host was a light which was to shine all over Europe. The priest told his fellow friars about the miracle, and the story of which soon spread about the town and the surrounding countryside. When the priest formed a procession to go to the fisherman's house for the Sacred Host, a huge crowd followed him and his fellow priests. They carried the Sa¬cred Host back to the church of St. Nicholas affording Our Lord the honor He deserved for giving such a rich gift to these humble people. Another wonderful element to the story is that the fisherman who had been dying, the one whom the priest brought the Eucharist on that first night, didn't die. To the contrary, he recovered, thanks be to God. However, when word of the miracle reached the ears of the townspeople, and those from other villages, they all went to the fisherman's house to see where the miracle had taken place. It soon became sort of a shrine, and soon afterwards, a Chapel. Official inquiries were made by the civil magistrate and also the city council, and upon investigation all were satisfied with the truthfulness of the witnesses. They affirmed the occurrence as fact and also endorsed the miracle in official City documents. The Church authorities, too, headed by the Bishop of Utrecht, held an extended inquiry before permitting the clergy to spread information about the event. In a Pastoral letter, the Bishop officially declared that an authentic miracle had occurred in the little town of Amsterdam. In the same pastoral letter, he authorized veneration of the Eucharistic Miracle of the Host. The little house of the fisherman was soon converted into a Chapel, called Nieuwe Zijds, or Holy Place and the Miraculous Host was placed upon the main altar, for the adoration of the people. The fireplace of the fisherman's hut was kept intact, and became a permanent part of the new shrine. A second miracle took place 100 years later. Amsterdam had grown considerably in the century since the first miracle had taken place. On May 24, 1452 the entire city of Amsterdam was engulfed in fire. Most of the buildings were destroyed by the blaze. When the Chapel of the Blessed Sacrament (the former fisherman's hut) caught fire, some of the parishioners made an at¬tempt to save the Miraculous Host from destruction by the flames. They tried to force open the tabernacle. The Host had been placed in a beautiful monstrance, which was inside the tabernacle. The heat of the Church was becoming unbearable. The workers worked feverishly, but to no avail. The heat of the fire had made it impossible to get the door open. As the roof of the Chapel began to cave in, the men ran out of the Church to safety, their mission a failure. The entire Church collapsed and burned to the ground, including the tabernacle. Upon seeing this, there was a great sadness among the faithful of the city, especially those who had tried in vain to rescue the Eucharistic Miracle. The next day, they sifted through the ashes of the Church, hoping against hope, that something remained of their precious Host. Their grief turned to joy as soon they spotted the Monstrance, completely unscathed, there among the ashes of the Church. Even the silk veil which covered the Monstrance had been saved from the fire. So, once again the Lord saved the same Host from fire in the same house in Amsterdam. Soon afterwards, a new chapel was built, more elaborate and more beautiful than the previous one. The fame of the Eucharistic Miracle of Amsterdam, now recognized as a twofold miracle, spread beyond the Netherlands to all of Europe. The Hapsburg Emperor of the Holy Roman Empire, Maxmillian, went to Amsterdam in pilgrimage to the Eucharistic Miracle. He prayed for a healing at the shrine, which was granted to him because of his faith. He showed his thanksgiving by donating beautiful gifts to the Chapel of the miracle. 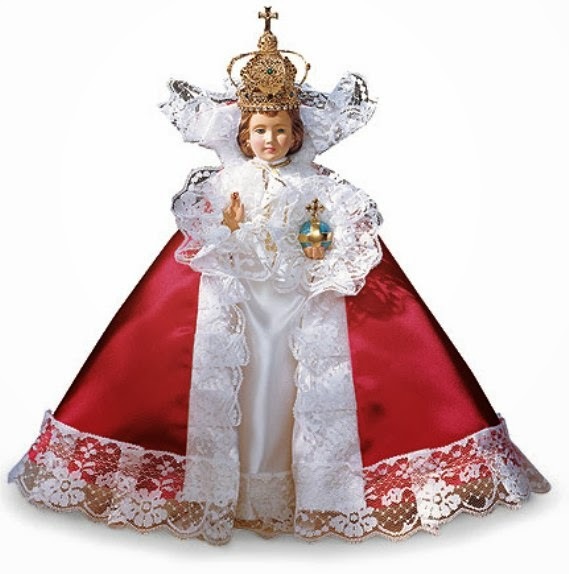 Amsterdam and the Eucharistic Miracle became a major place of pilgrimages and processions. In 1665 the city council authorized Father Jan Van der Mey to convert one of the houses of the former convent of the Beghine into a chapel. 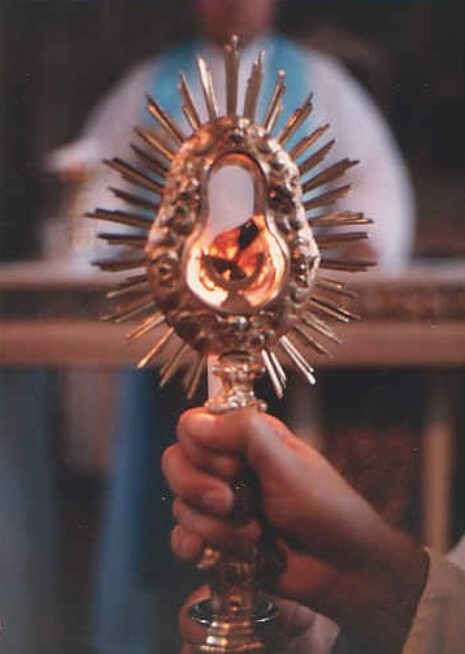 After completion, the precious monstrance was transferred, but unfortunately was shortly afterwards taken by unknown thieves. Even today there is perpetual exposition of the Blessed Sacrament in memory of the miracle. 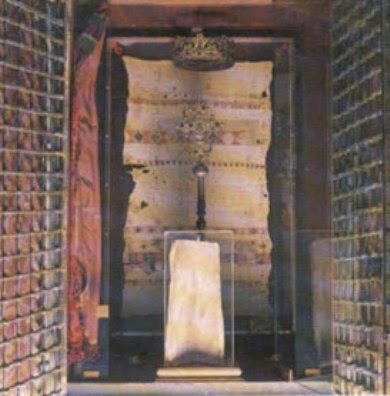 The only objects that remain from the Eucharistic miracle are the case that contained the Sacred Host (pictured in the photo to the left), the documents that describe the miracle, and some paintings housed in the Historical Museum of Amsterdam. Every year there is a silent procession (Stille Omgang) in honor of the miracle on the eve of Palm Sunday. The miracle of the Eucharist in Offida, Italy (1280) –The Story of Newlyweds, a Sorceress and a Mule. The Eucharistic miracle of Offida actually took place in the city of Lanciano, the site of another extraordinary miracle not related to this one. This miracle, which is now kept in Offida some 60 miles north of Lanciano, occurred in 1273 to a newlywed couple named Ricciarella and Giacomo (James) Stasio, their mule, and a witch. This description of how her husband would react to the potion gave Ricciarella just the incentive she needed to justify committing this sacrilegious act. She knew, of course, that this was wrong, and how she must have wrestled with her conscience before she made the decision to perform this horrible act. Eventually she worked up the courage and she set out for the church to take part in the Holy Mass. In desperation for relief from her sad situation, Ricciarella received the Eucharist, and secretly let the Host fall from her mouth into the top of her dress. After taking it home she placed it on a coppo, which is a semi-circular tile. She then placed the tile over a fire. As soon as the sacred Host was heated, instead of turning into powder it began to turn into a piece of bloody flesh. Horrified at what was taking place, Ricciarella attempted to stop the process by throwing ashes and wax onto the tile, but without success. The tile soon bore a huge smear of blood, and the flesh remained perfectly sound and blood came forth from the Host turned flesh. Understandably Ricciarella panicked. She didn't know what to do. Frantic for a way to dispose of the evidence of her sacrilege, Ricciarella took a linen tablecloth decorated with silk embroidery and lace and wrapped it around the tile and the bloody Host. Carrying the bundle outside, she went to the stable and buried it in the place where garbage from the house and filth from the stalls were heaped. When her husband returned home that evening accompanied by his work mule, he noticed that the mule was acting more stubborn than usual. The animal did not want to go into the stable. Giacomo tried pushing the mule, and then slapping him, all to no avail. Finally he got a whip and began beating the animal. The pain being more than the mule could endure, he reluctantly went into the barn, all the while staring at the dung heap. The animal fell prostrate near the dung heap, almost in a position of adoration. The mule had never done such an extraordinary thing before and Giacomo knew for certain that something was causing this mysterious behavior in his mule. Giacomo then accused his wife of placing a spell on the stable that made the animal fearful of entering it. Ricciarella, of course, denied everything and remained silent about the cause of the difficulty. For seven years the Blessed Sacrament remained hidden beneath the garbage, and for that period of time the mule and the other animals went in or out facing the dung heap, keeping their attention to the heap of refuse. For Ricciarella, this was the beginning of living hell. She felt great pangs of conscience for her sin. She came to realize more and more the seriousness and consequences of her actions. She was instead tormented day and night with remorse for her sin. 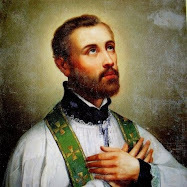 Finally she decided to confess what she had done to a priest from the monastery of St. Agostino in Lanciano, Prior Giacomo Diotallevi, a native of Offida. After Ricciarella confessed her grave sin to the priest, he accompanied her back to her home. They went into the stable, and dug through the dung which had accumu¬lated over the seven years. When the friar pulled the table cloth out, and uncovered it, he found that the contents of the tile, the bleeding Flesh and the Host, had remained incorrupt over the years. He took the tile and the table cloth containing the Host with him and he returned to his monastery. Initially he told no one of the incident. Ricciarella was relieved because her scandal would not be spread all over the province, and her deteriorated relationship with her hus¬band would not worsen. No one is sure what the friar's motives were but he wanted the Eucharistic Miracle taken away from Lanciano, that is known. Was it because he was sincerely afraid that if the miracle were revealed, Ricciarella would be implicated? 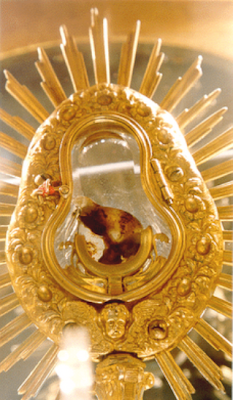 Or did he want the glory of an incorrupt Eucharistic Miracle to be given to his home town Offida? On a pretext, the Friar received permission from his superiors to leave the monastery. He left Lanciano in secrecy a few days later. He took the Sacred Host to a Fr. Michael Malli¬cani, who was the prior of the Augustinian monastery of Offida. Father Mallicani embraced the miracle as the property of Offida, and immediately created a sanctuary for It in that town. This was in the year 1280, seven years after Ricciarella had committed the Sacrilege. Father Mallicani moved quickly. He and another friar went to Venice in the same year to have a beautiful reliquary built which was to become the home of the Eucharistic Miracle. They commissioned a silversmith to do the work under secrecy. 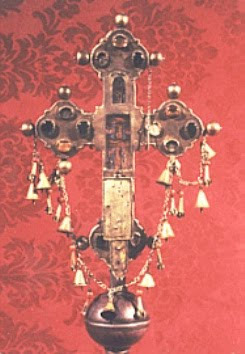 For this reliquary a large amount of silver was donated and it was decided that the reliquary would be made in the shape of an artistic cross, and it was to contain not only the miraculous Host, but also a piece of wood from the true cross of Christ. After he had finished the beautiful reliquary, and the priest had placed the Eucharistic Miracle inside, the friars left by boat to return to Offida. It was then that the silversmith decided to tell the local Duke of Venice what had transpired. The Duke, anxious to get hold of a genuine Eucharistic Miracle for his own province, ordered a ship to intercept the one carrying the two friars back to Offida. But in the end it was the Lord who intercepted! As the Duke's ship was about to overtake the friars, the Adriatic Sea became violent, allowing the friars to disembark at Ancona, and return safely to their monastery in Offida. The reliquary was installed in the Church in Offida and it remains there to this day. And so it is that today atop the main altar of the Sanctuary of Saint Augustine in Offida, also known as the Sanctuary of the Miraculous Eucharist, is found silver cross containing the miraculous Host. The tile on which Ricciarella heated the Host, still showing the smear and splotches of blood, is kept in a rectangular glass-sided case. The tablecloth in which the tile and the bloody Host were wrapped is also kept under glass. Paintings depicting the events of the miracle can also be found within the beautiful Church. These are lovely stories. I notice a typo in the third Eucharistic story, see bold. ...The mule had never done such an extraordinary thing before and Giacomo knew for certain that something was causing this mysterious behavior in his mule. This was a very needed public service. Thanks for the information about the eucharistic miracle of Alatri. The link you provided was very informative! I looked up the topic for a much needed inspiration and revoking of faith. It seems to be working. May the Lord bless all that you love. We have information about opening and closing times and prices of transportation from Lisbon airport to St. Stephen´s Chrch. Adapted & Senior Tours offers a service for all, even for those who have reduced mobility, and we use a specialized adapted vehicle. Our company has Licence from Turismo de Portugal. All of our tours have proper insurances. here is the link about the news. My uncle saw this miracle, he is from that parish!!! May Jesus be always loved and adored in the Holy Eucharist! As Roman Catholics, we need to remember that as extraordinary as these Eucharistic miracles are, these miracles occur everyday in our local churches! We should not get too focused on "those" while ignoring the beauty of what happens within our own tabernacles. Thank you so much. Your ministry is a blessing to all! i am inspired with the real stories of miracles. God is ever present and has manifested his great love for us. Here is another typo in the 3rd story,(Undertandably), should be understandably. Hello Mr. Dallaire Glenn! I love your post so much. 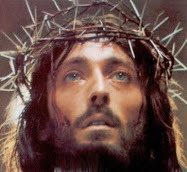 I am writing an article for distribution about the true presence of Christ in the Holy Eucharist. I want to use this your articles of miracles to support it. I want to first of all ask for your permission and also how you want to be acknowledge. It is nice to her from you. Thanks for your comment. To reply, yes, feel free to use any of my articles for your work. HOW BEAUTIFUL TO READ OF THE MIRACLES! GOD BLESS EVERYONE! GOD BLESS THE ENGAGED COUPLE RICHARD & LORRAINE, THE VERY NICEST COUPLE, IN AN EVERLASTING UNION THROUGH CHRIST! MY HEART AND SOUL IS SO DEVOTED TO OUR FATHER, THE LORD JESUS CHRIST!